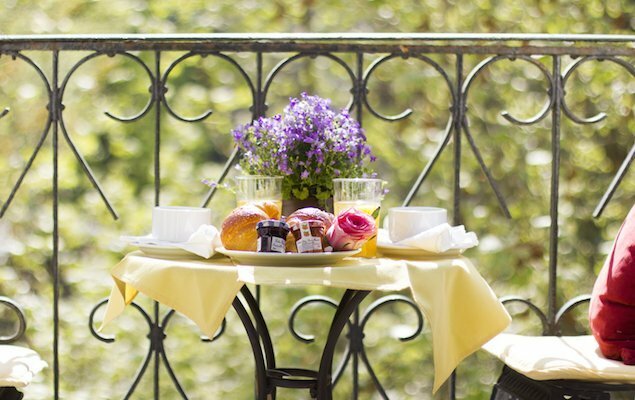 Petit déjeuner on the balcony of the Chambertin apartment. 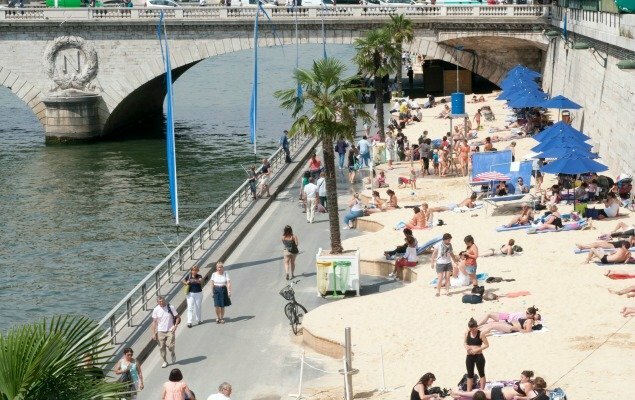 Paris is a city for lovers, and that doesn’t stop at the romantic architecture, lush gardens and fine dining – oh no. Where you choose to lay your head at night is just as important when planning an amorous getaway together. While we think all of our apartments are romantic, we’ve handpicked a few that are absolutely perfect for couples. 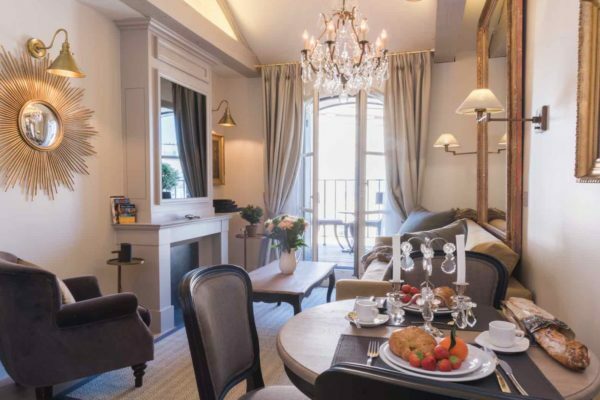 These are all just the right intimate size, and they all have special features that set them apart from the rest – magical balconies, Eiffel Tower views and plush interiors. Keep reading and you’ll discover the romantic apartments of your dreams! We had to put the Chambertin at spot no. 1 for its amazing bathtub view! 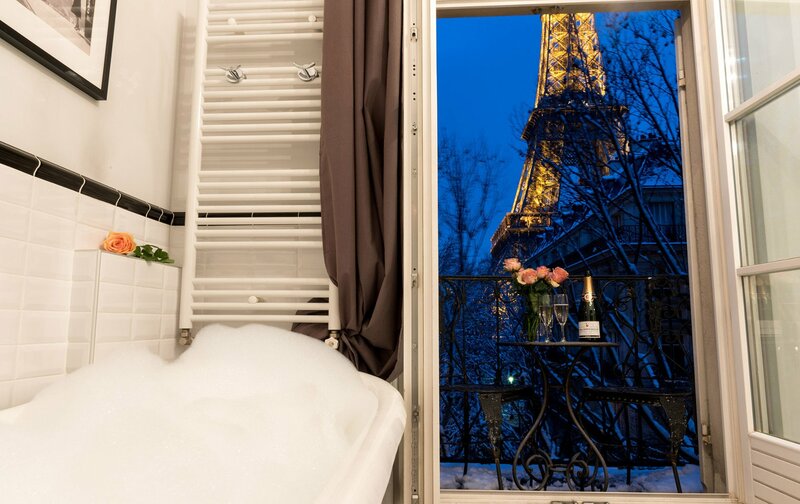 What could be more romantic than soaking in a claw-foot tub with the Eiffel Tower twinkling through your window?! Adding a glass of champagne would be the cherry on the cake. 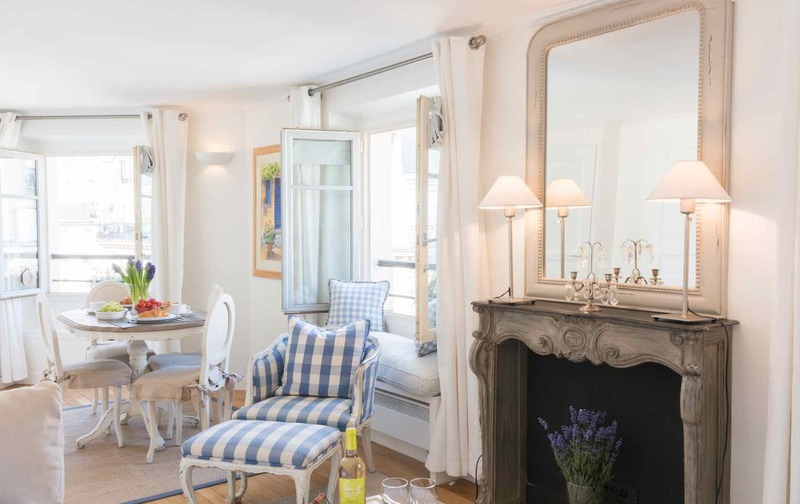 The Chambertin also has a fantastic balcony that spans the width of three french doors, with the same stunning view throughout the apartment. The living area is open-plan and the bathroom is en-suite. It’s the perfect Parisian abode for any couple. Champagne, the beverage, usually marks times of celebration, and this sweeping view certainly calls for merrymaking! That’s why we named the apartment Champagne, because of it’s supremely romantic, celebratory ambiance. Seven sets of French doors (yes, seven!) 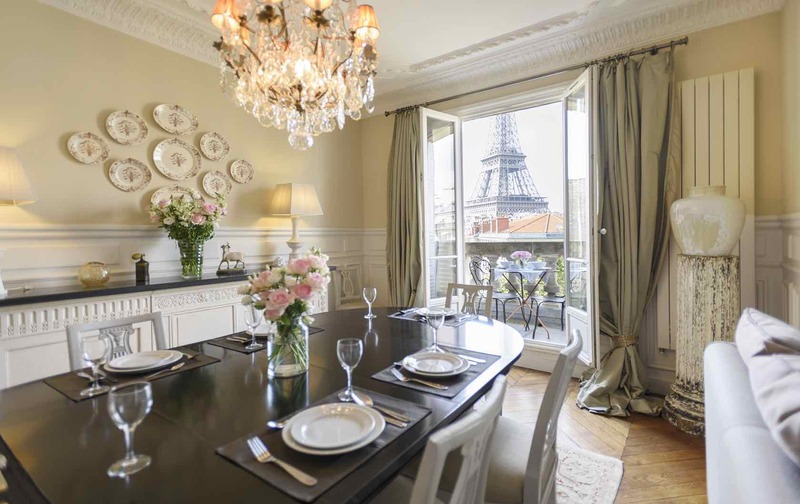 lead out to a wrap-around balcony that features panoramic views of the surrounding buildings and Eiffel Tower. 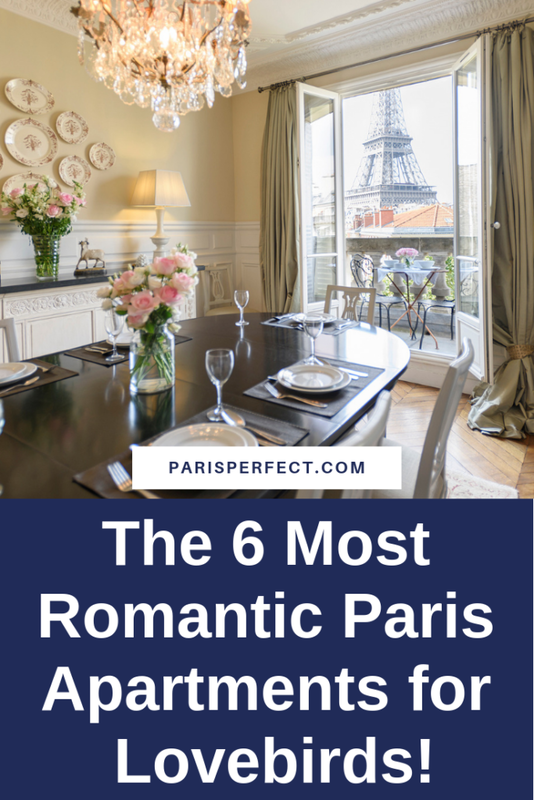 This balcony frames the entire apartment, so literally every single space in the house, including the bedroom, offers the most romantic view in all of Paris. 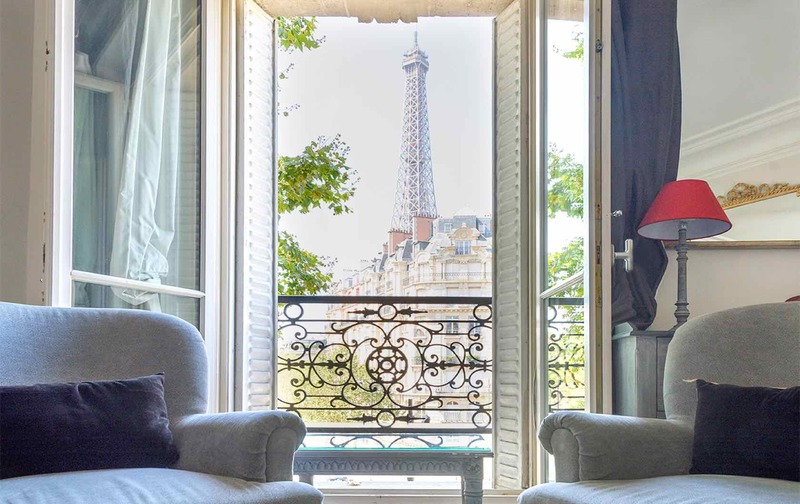 When you’re talking romance and Paris, you simply can’t go wrong with a spectacular Eiffel Tower view like this one from the Volnay apartment. Perfect for a romantic getaway, just imagine spending time with your loved one with that front row view of the Eiffel Tower sparkling at night during the magical light show. The furnishings and décor of the Marsannay apartment are absolutely sumptuous! In every nook and cranny, you’ll find beautiful details. There are elegant marble fireplaces in both the living room and bedroom, gilded frames and antique mirrors throughout, marble countertops in both bathrooms, a chandelier over the dining table and elegant sconces framing the bed, just to name a few examples. Even the walls are romantic, finished in classic Parisian paneling with original decorative plasterwork on the crown moldings. 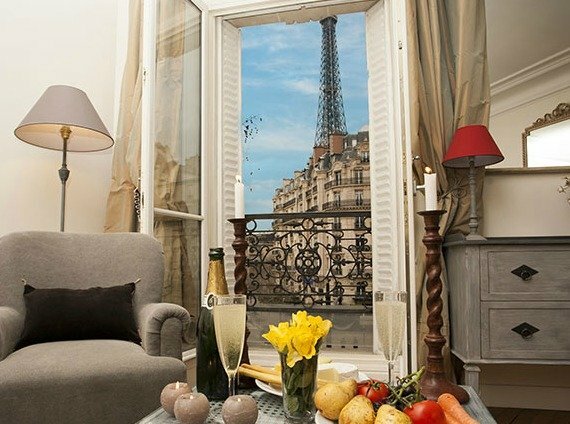 Top all this off with one of the most comprehensive views of the Eiffel Tower, and we think you’ll find the Marsannay apartment the definition of Parisian romance! The Muscadelle apartment lives up to its name: windmill. It has a breezy, quaint feeling that will make you feel relaxed and comfortable. We especially love the large bedroom with its two windows, chaise lounge and desk area. Bedrooms in Paris are often just big enough to fit the essentials, but the Muscadelle bedroom leaves room to lounge. You can read a book in the morning light on the chaise, or perhaps you’d like to do a little journaling or internet surfing at the desk? An even better idea – breakfast in bed! This bedroom was made for long, lingering mornings and spending quality time with your loved one. 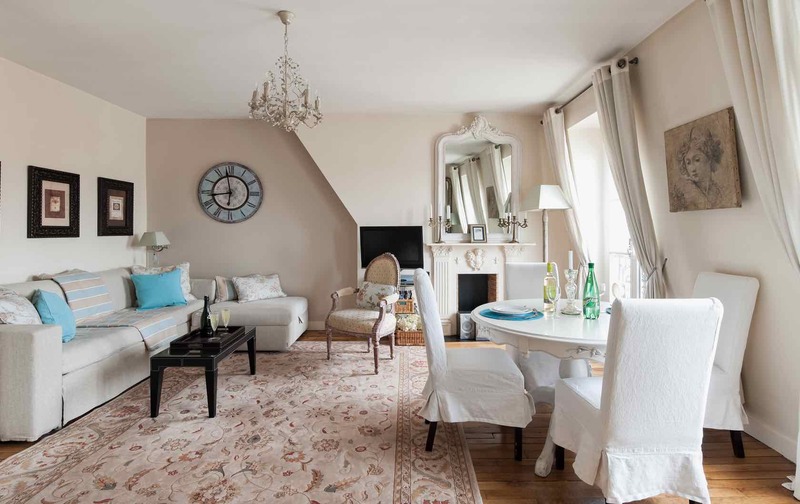 The rest of the apartment is of course, perfectly suited for a couple, and the view is romantic in a subtler way; because the apartment is on the 7th floor, you get some lovely, almost bohemian views of those famous Parisian rooftops. The Pomerol is so charming! Just look at the padded window seats and blue plaid fabrics! You will get a view of the Eiffel Tower’s tip, but the best part of this apartment is the prime location directly on Rue Cler. Hop downstairs to grab some quick croissants for breakfast or spend a long, leisurely evening enjoying dinner at a restaurant nearby. You won’t have to worry about getting lost on your way home because it’s literally a few steps away! The Pomerol offers the best of the 7th arrondissement. If you’re interested in booking a romantic stay in any of these apartments, don’t hesitate to contact us! You can email [email protected], fill in this form or give us a call. 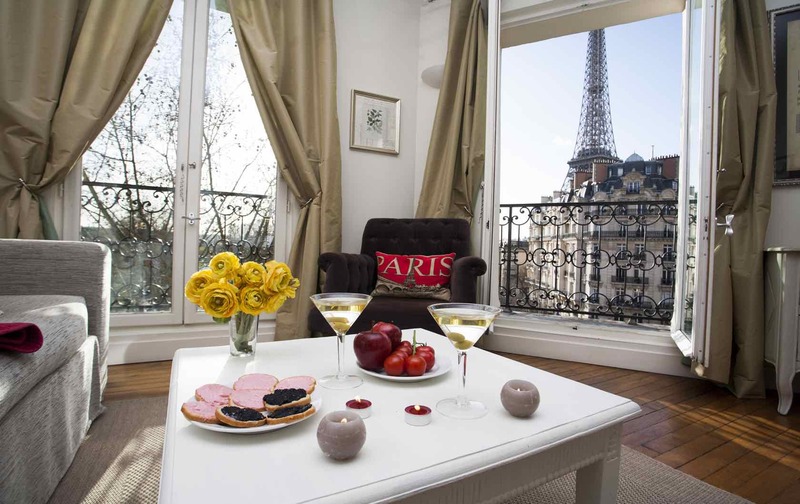 We would love to help you plan the perfect romantic stay in Paris! If you’re dreaming of a trip, we invite you to take a closer look at the apartment profiles, all linked above. Feel free to bookmark these ideas or add them to your Pinterest boards! PREVIOUS: Show Your Love with these Chocolate Raspberry Verrines! NEXT: The “Petit Bijou” is Finished! Can You Believe the Transformation? Posted on Friday, February 12th, 2016 at 10:24 am in Apartment Rentals. You can follow any responses to this entry through the RSS 2.0 feed. You can leave a response, or trackback from your own site.